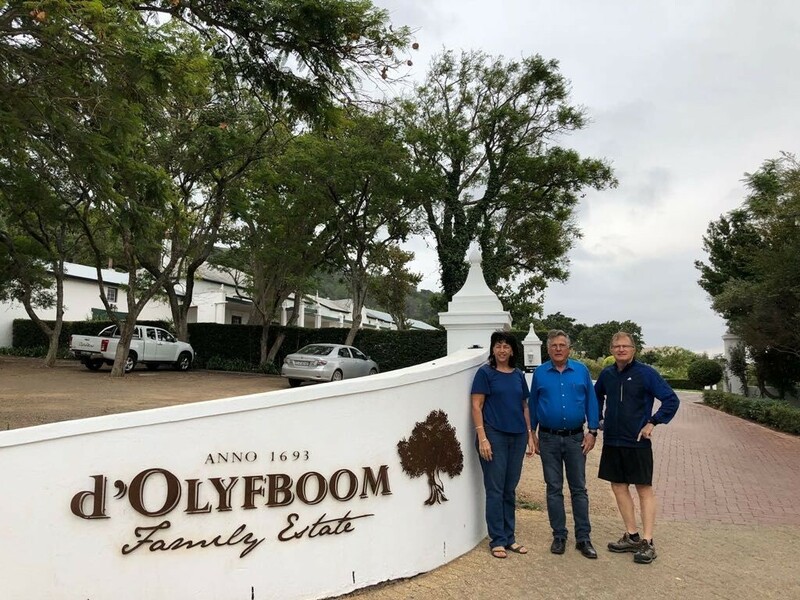 Michelle Harding (Legacy Water Solutions), Professor Adar and Danny de Wit (d'Olyfboom Family Estate) at the entrance of d'Olyfboom Family Estate in Paarl. 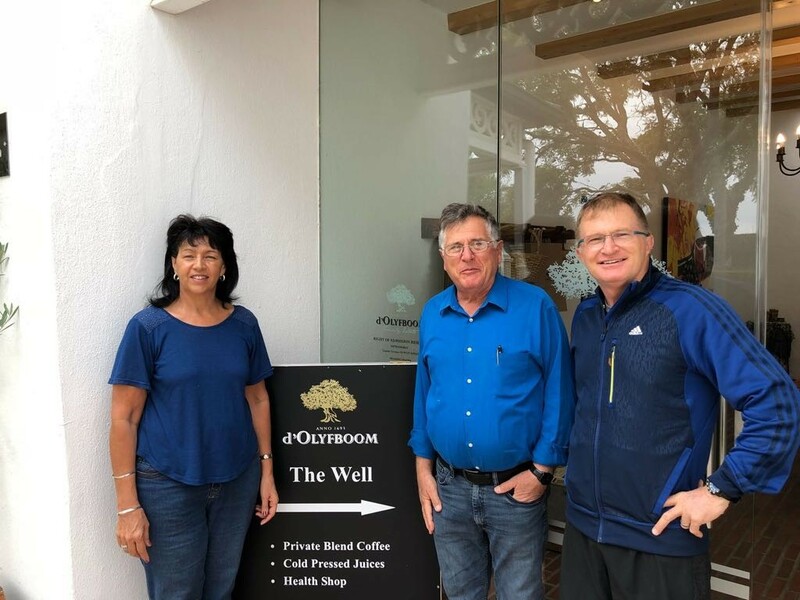 "South African farmers are in general well educated, highly motivated and knowledgeable and this gives me hope that a solution to the Western Cape's water challenges will be found in time," says Professor Eilon Adar, Alain Poher Chair in Hydro-Geology and Arid Zones, Director of the Zuckerberg Institute for Water Research (2002-2015), Deputy Director for International Affairs - Blaustein Institutes for Desert Research, Ben-Gurion University of the Negev, Israel. As a highly respected Hydro-Geologist and a global authority on water matters, Professor Adar was visiting South Africa last month and met with more than 200 farmers and agricultural representatives during two seminars in Paarl & Robertson, hosted by the Israel Trade Commission and Legacy Water Solutions. He also visited several individual farmers on their farms to discuss water challenges and the solutions which can be implemented to make the region sustainable and manage the resources available. "Make no mistake, South Africa is in a water crisis, which is a result of inappropriate and slow reactions to the recent series of dry years, as well as a lack of knowledge and old outdated infrastructure.However the solution lies in co-operation between municipalities and agriculture and that is attainable," he says. He stresses that although water is a "gift from nature", it should not be used without thinking of the consequences and as if its supply will never end. Water equals Food and humanity already cultivates most of the available arable land, which leads to the inescapable conclusion that future crop production will come out of marginal arid basins with massive irrigation, which is necessary to keep the production at a level which can feed a fast-growing population. "What impressed me was that farmers are not waiting for solutions from government or anyone else. They are making plans with the resources they have, which often consist of boreholes and use of ground water when rivers and dams could run empty." Prof Adar highlighted a concern about little or no collaboration among neighbours leading to the uneven exploitation of ground water in a particular area. "For example, it might be better for a farmer who has a productive borehole to provide or sell water to neighbours, instead of everyone digging boreholes so that everyone only ends up with a trickle, " he commented. One of the options to investigate is the bartering/trading of clean drinking water from agricultural sources with reclaimed sewerage water from municipalities, which can be used for irrigation. Another is to urgently combine forces and appoint experts to properly investigate exactly how much ground water is available in the various basins, so that the exploitation or abstraction thereof can happen in a planned manner to avoid damage to groundwater. New and modern infrastructure must follow so that water requirements and available water can be combined into one inter-connected pipe-grid. An example of this is the use of pipes to convey water from several sources instead of canals, which are less manageable and inefficient. Investigating and developing new sources of water is also important and this must be on-going. Amit Lev, Trade and Investment Commissioner of the Embassy of Israel to South Africa, spent most of the visit with Professor Adar to offer assistance and share ideas in the South African context. He added that Israel had gone through a similar drought experience 10-15 years ago. "The severe shortages more than a decade ago in my country led to an explosion of innovation and the development of new technology to maximise our water resources, and we feel this will happen in South Africa too. Necessity is the mother of all invention, and our experiences during the trip around South Africa and our interaction with a diversity of role players in the agricultural sector proves the point," he said. Professor Adar will be back as a guest of Legacy Water Solutions later in the year and will once again share his expertise with interested parties.